'Where in the World is My Team?' by Terence Brake is the first business book I've come across that pulls off framing the learning with a story. If you fancy a bit of light entertainment before getting to the "meat", I recommend this book. As to the content on how to work in a global team, I find it refreshing in its honesty (which also gives rise to humour, made me laugh out loud) and I'm impressed by the detail. In particular, I found the dissection of trust to be the most thorough I have come across yet. "You can put in place all the technology you want," Sadie went on, oblivious to my lap dancing tomato war, "but you're still working with real people with all their quirky likes and dislikes, petty jealousies, power plays, neuroses and paranoia, and, in the meantime, you're trying to get your work done across multiple time zones and cultures. It's a bloody nightmare!" In my previous work life running a theatre company, I used to struggle with giving "corrective feedback" to those freelancing for the company. I always worried that the enthusiasm and good will that was often the reason for them working with us would be squashed. I managed to get over some of that by following the advice of a very experienced trainer/coach, Cliff. "Remember, you're a good person", he said. That did the trick. As I found it difficult to have conversations in person, I can also imagine what those in a similar frame of mind, and working virtually might go through. 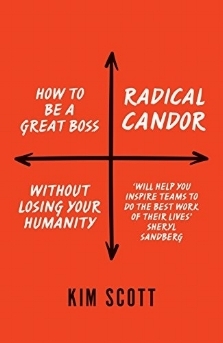 That's why I read 'Radical Candor' by Kim Scott, to understand a bit more what the issues are for managers who find it difficult to give feedback that would, after all, help people develop. And who would not welcome that kind of feedback? '168 Hours' by Laura Vanderkam offers a new way to think about how we use our time, and whether we're spending our time in a way which fulfills our intrinsic motivations. Challenging the myth of time-starvation in modern life with hard data and thorough research, it's particularly relevant for knowledge workers in flexible roles - but also offers practical strategies that anyone can use, to help design a professional and personal life in balance and harmony. By thinking about the week as a whole, '168 hours' is a generous allowance to play with - and make time for work, relationships, wellbeing and relaxation, on your own terms. It's not about multitasking, or life-hacks to squeeze in more minutes here or a quicker outcome over there... Packed with fascinating case studies of people who have successfully mastered or renegotiated their own relationship with time and their priorities, this is a fascinating and highly recommended read. I know, it's taken me a while to read this "bible" of remote work. 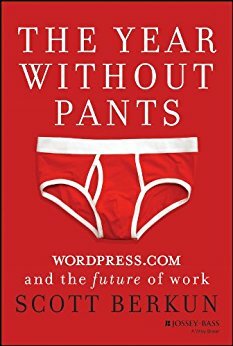 'The Year Without Pants' is the memoir of Automattic's first manager, Scott Berkun and is full of reflections on working in a 100% remote company. An insightful picture into this autonomous, open culture, with all its drawbacks. To hear more about Automattic from Tish Briseno, Happiness Engineer, listen to episode 136 of the 21st Century Work Life podcast. Personally, it's a great reminder of basic concepts like the fact that "we often undercommunicate our ideas. They're already so familiar to us that we underestimate how much exposure an audience needs to comprehend and buy into them." It's been a while since I devoured a book, and I certainly devoured 'Under New Management' by David Burkus. The book presents an overview of how some companies are replacing traditional practices with those fit for the 21st Century. From replacing email with collaboration platforms and the benefits of sabbaticals for all employees, right through to keeping the organisational chart nice and fluid. With plenty of examples of when new practices have worked and, even more importantly, some examples of when they didn't. "Great leaders don't innovate the product, they innovate the factory." If you've read 'The Power of Habit' then you'll know what a great storyteller Charles Duhigg is. 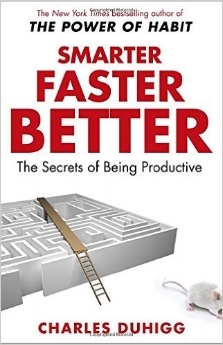 'Smarter, Faster, Better' doesn't disappoint as he weaves stories (not just from Google and Disney etc but also from airline crews and poker players) with research and advice about a diversity of topics like decision-making and innovation. "The paradox of learning how to make better decisions is that it requires developing a comfort with doubt." To hear about psychological safety, covered in this book, check out episode 9 of Management Cafe. Would you like to receive more book recommendations directly to your Inbox? Sing up for our monthly newsletter, where we recommend books, articles and podcasts about remote work and the future of work.